Mike was able to visit Luke and Jillian's preschool class this year for fire safety week. 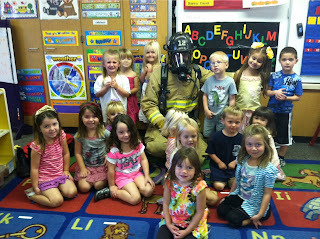 The kids all had a great time learning about fire safety and checking out all the fire gear. Jilly apparently was nervous with daddy fully dressed, she didn't want to hug him...oh my nervous nelly!